Encoder Products' new 25SP is a rugged, heavy duty shaft encoder designed for a multitude of industrial and non-industrial applications. The 25SP comes standard with an industrial housing, dual bearings rated 80lbs axial or radial, and an IP67 shaft seal. The dual bearings make the 25SP able to handle heavy-duty applications and the IP67 sealing keeps the encoder working in challenging environments. The Model 25SP features an easy-to-use, point-and-click interface, making programming quick and straight-forward. 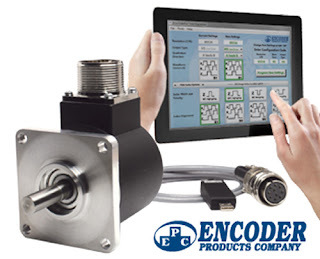 The number of possible configurations makes this Size 25 programmable shaft encoder incredibly versatile. Enjoy the video below from Encoder, featuring the Model 25SP. For questions or to request a quote, please contact C&E at 800-228-2790.